I first heard about Kara Tippets when I read a letter she wrote to a young lady who was suffering from cancer and planning a physician-assisted suicide because she didn’t want to fight it and suffer the ravages that were sure to come. Kara has cancer too, and could identify completely with the lady’s pain and fears, and Kara plead for her to look for beauty and hope, because it’s there. The letter was so beautiful and compelling that I went to Kara’s blog to read more of what she wrote. She was an English major, so it figures that she has a way with words. I loved what she wrote, but I left the blog and didn’t go back to it for awhile because it felt voyeuristic to read about the body blows the cancer was wrecking on her. But I went back when I realized the wonder of how Kara writes with beauty and grace about their immeasurable pain and sorrow, and it showed me how grace and light is always bigger than whatever darkness is around. I started following her on Facebook because I wanted to bear witness to that light and strength and joy. Kara is 38, a wife of a church planter, and mother of four children. They never expected their story to look like this–beautiful, but not pretty, as she says. 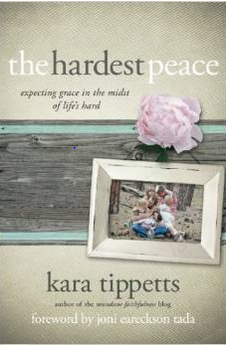 I was restless this week for a good book, found Kara’s book, The Hardest Peace, on my house-sister’s bookshelf, and finished it today. It undid me in many ways. I cried through most of it. It is poetic and heartbreaking and honest and brave and anointed. Everyone should read it, but you should probably have someone to debrief with. Kara is home from hospice now, her hair is growing back, but she’s writing less and less. Most mornings, I wake up and wonder if she’s still with us. There is a network of believers laced all over the globe, praying for her, supporting the beautiful family, waiting with them in wings before she enters the throne room. This waiting is sacred, crushing, unbelievably cruel, and beautiful. I went to bed soon after I posted, and didn’t see the update until morning when I saw your comment. Yes–how celebrating, radiant and whole she is now! this has been on my to read list for awhile…thank you for sharing. I have gleaned lots from her internet writings and cried as I read of her homegoing this morning. I cried too, Charis. It’s a mystery and a beauty, how the family of Christ stretches over the globe and cares for its own and hurts when another hurts. I too wept my way through her book a month or two ago… I didn’t want to go on reading it and I couldn’t stop reading it… And I’m crying again today as I reflect on her homecoming and especially on her littles she left behind. *hugs* I think one reason many of us are so deeply moved by her words is we all have a nagging inner question about the grace we will or won’t find if we are ever asked to be in the place of the Tippetts family…. And knowing she experienced abundant grace and peace, of the hardest sort for sure, but to know that they WERE/ARE there… assures us that we too will be found by grace and peace when our time comes. You’re right, Linda. She spread hope so lavishly, which is something everyone is hungry for. Thank you so much for this recommendation! This is helping me so much in my situation! I never heared about the book nor her blog, “meeting” her is motivating me beyond words! Thank you for the link to her blog as well, the memorial service was amazing!